love those pants you are wearing! Great pants and pattern mixing! LOVE this top! Perfect with stripes. Gorgeous!! I like your sunnies and bag very much ! I actually sighed when I saw your top. Beautiful! Probably one of my favourite outfits you've ever put together! It's totally fun! This look is so fresh and fun! I love it! I am in love with that top and pattern mixing! Beautiful blouse! That print with the stripes looks great! You find the best pieces I swear! That outfit is adorable and fun. You never disappoint! A great way to do vertical stripes. I adore this!! Normally I stay away from mixed patterns because I can't seem to put them together right, but this is awesome. Love the pants! You are so good with mixing different print. This works so good together! Absolutely stunning. This mix of patterns is so eye-catching ... I love it! This is definitely one of my favorite mixing looks i've seen this spring. that top is so lovely and summery! I love the mix of stripes and florals! beautiful! this is another one of those outfits only you can pull off! gorgeous look! so risky but it works!!! you are the best dressed blogger out there. JUST SAYIN! Aww that's the style I've been rocking lately for my free hours. Love this combo Krystal! So fun!! LOVEthis! the perfect concoction of prints and bright colors! 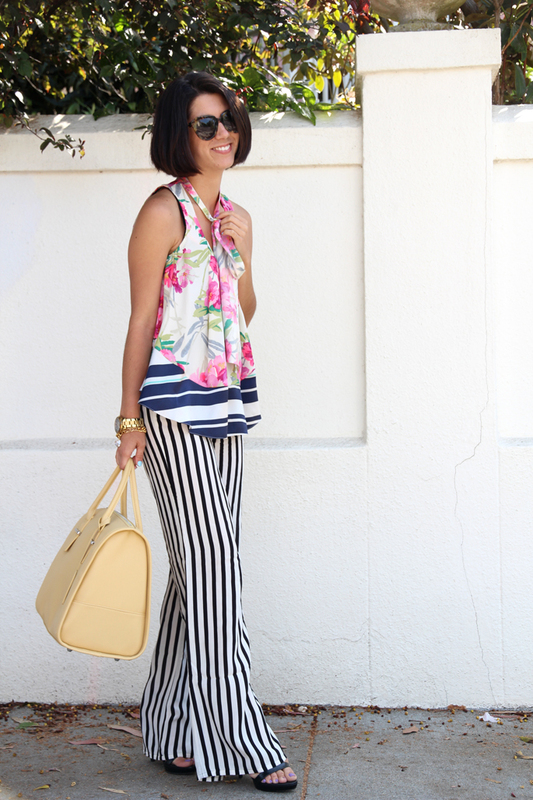 Love how you matched the stripes with the florals! Ooooohhhhh heyyy look at you! This outfit is awesome! love it! 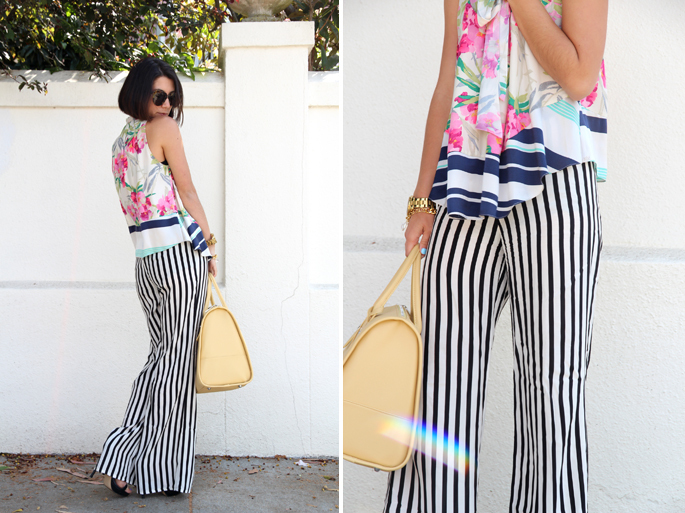 Love that top and the combo with the striped pants - genius and easy breezy! That top is sooo beautiful!! MOST FAVORITE! MOST FAVORITE! CAN'T STAND IT!! Love it! This is one of my fave looks Krystal. Loved the sneak peak on instagram & love it even more in full! So fabulous, what a great mix of patterns! Thanks for the inspiration! Amazing bag! I was looking through your outfits and noticed you use a lot of Zara stuff - this is one of my favorite stores as well but I don't get a lot of pieces from there, cause it's hard to create outfits with them. Thank you for inspiration! 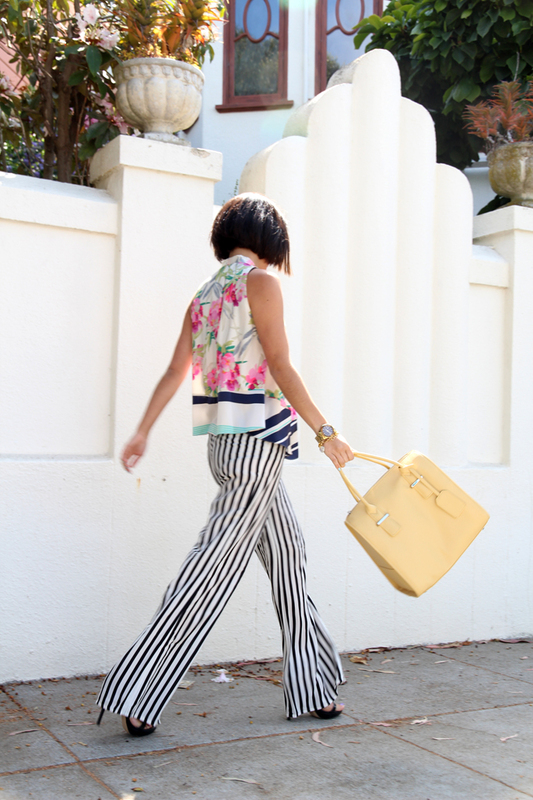 I adore these pants and florals and stripes are my favorite combo right now! You almost made me think that I can pull off this look! lol FAB!! It looks funny! I love it!! Amazing! You look so cool and stylish! Fun way to wear pattern, so cool. I love this outfit!!! So chic. Love it!!!! wow. i opened this post and it literally took my breath away...amazing. you are gorgeous! Oh I love your top Krystal! Gorgeous.